You know that taking care of your health is essential to your well-being, but did you know that taking care of your health is also essential to your financial well-being? The Sun Life Canadian Health Index shows that there is a direct link between financial hardship and ignoring your health. “Although there is a lot of assistance available in terms of our health care system to cover health care costs, there is still a financial burden to be carried by an individual. Out of pocket costs for some medications, services and equipment can be substantial,” says Jeff Schwartz executive director, Consolidated Credit Counseling Services of Canada. 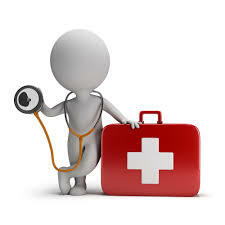 “When you are sick or injured, the focus should be on getting well again. Unfortunately for many people, they end up having to take on the burden of debt and the associated stress instead,” says Schwartz. Here are some tips to help reduce financial hardship in the event of injury or illness. You’ve heard the saying, “An ounce of prevention is worth a pound of cure”? Take that to heart, especially when you consider that ignoring your health has implications on your finances and your well-being. Although you can’t completely control getting sick or injured, there are measures that you can take to reduce the likelihood of contracting some illnesses. Getting healthy doesn’t mean that you have to spend a fortune on groceries or take out expensive gym memberships. Going for a brisk walk a few times a week is free and provides cardiovascular benefit. Frozen fruits and veggies are a healthy, cheaper food alternative. If you have health care benefits through your employer, don’t assume that everything you might need is covered. Find out what circumstances, products and items are not covered. Don’t make yourself vulnerable to financial strain by the surprise of emergency expenses for medication, physio and rehabilitation, aftercare or other health costs. Also double check on your disability coverage and find out what the limitations are. Go under the assumption that there will be a point in your life that your health will cost you money. By planning ahead and earmarking savings to cover these costs, you will be less reliant on debt. Wouldn’t you rather put a little money aside now instead of racking up credit card debt or being forced to downsize your home? If you’ve had to take on debt to cover costs because you’ve been sick or injured, it’s time to take control and get ahead of your debts. To start developing a plan, call one of our trained credit counsellors at 1-888-294-3130 or visit our free online debt analysis.